In the 60’s Jack Kirby began to draw clusters of round black dots to depict enormous but not necessarily directed energy, often of a cosmic nature. This simple graphic technique was so effective that it has been picked up by other comic book artists and can still be found in comics of today. The device has been given the name Kirby Krackle. It is an annoying cute* name but one that has become so entrenched that I feel that it must be accepted. But what are the origins of Kirby Krackle? Some comic book scholars have pointed to a panel from Fantastic Four #46 (January 1966) where the Inhuman Triton is depicted in water surrounded by bubbles and black shapes that look surprisingly like Kirby Krackle. Nothing to suggest energy or anything cosmic but visually similar enough that perhaps it formed the basis for an imaginative leap by Kirby. Old grainy photographs of Quasars (astronomical objects discovered in 1963) have also been suggested to be the inspiration for Kirby Krackle. Because at the time inkers were encourage to embellish the pencils some have even suggested that it was the inker Joe Sinnott that actually created Kirby Krackle! Such explanations for the origin of Kirby Krackle were all reasonable but those who presented them overlooked Jack Kirby’s long career. Jack had a long memory and old ideas would reappear many years later. There is no better example than Kirby Krackle. The first appearance of Kirby Krackle appears to be found in Blue Bolt #5 (October 1940)**. This really is likely to be the earliest example of Kirby Krackle. Kirby did some previous science fiction stories on his own but nothing resembling Kirby Krackle appears in them. Nor did it appear in Simon’s earlier science fiction nor in the previous issues of Blue Bolt. It is unclear who to credit with this device as Kirby did the pencils and Simon the inking. Unfinished art from later in the Simon and Kirby collaboration shows that while Kirby’s pencils were pretty tight they were line art only with all spotting left to the discretion of the inker. However this example of Kirby Krackle is from early in the Simon and Kirby partnership (which started with Blue Bolt #2, July 1940). This is so early in their collaboration that is would seem reckless to make any assumptions on what were their working methods at that time. In some respects this is a perfectly acceptable example of Kirby Krackle. But it is not yet the perfected form. While the massing of particles is very much like typical Kirby Krackle the particles are not round but irregular, often angular, in shape. However it is clear that this early example shares the same intent as the caption describes it as having “crackling energy”. Simon and Kirby did not do much science fiction and it would be years before something very much like Kirby Krackle made its appearance once again. In 1953 Simon and Kirby put together Captain 3-D for Harvey Comics. It was a rush job to try to take advantage of the 3D craze. All the pencils were by Jack Kirby but the inking was done by an assortment of artists which besides Jack and Joe included Mort Meskin and Steve Ditko (for a more complete examination of the inking see Captain 3D). In the origin story, “The Man from the World of D”, a villains uses a special weapon which releases energy outside the actual firing path. The weapon from the Captain 3D story has a cosmic connection as it is described as a gamma ray gun. In some ways this is not as close an example to Kirby Krackle as that found in Blue Bolt perhaps because of the difference between a dimensional doorway and a weapon. The particles are not clumped together as well as in the Blue Bolt example but have become less irregular in shape. While some have become more rounded other particles still are rather angular. There is good evidence from unfinished art that by this period Kirby’s pencils provided outlines only with only simple lines to indicate things like the folds in the clothing. How the spotting was to be done was left to the inker. Most of this page was inked by Steve Ditko but Joe Simon applied a lot of retouching. While it is difficult to say with any certainty who to should be credited with the inking of the Kirby Krackle the similarity with the next example suggests it was likely Simon who applied the it. The futuristic gun appears once again in the next page from “The Man from the World of D”. The arrangement of the particles is very much the same as the previous example but the particles themselves have lost any angularity and become more rounded. They would not however be described as truly circular in shape. This page was inked by just Joe Simon and so he was likely the one to supply the Krackle. Once again the use of anything akin to Kirby Krackle does not appear for some time largely because there were few if any stories where it might be appropriate. After the Simon and Kirby partnership ended Jack began to do freelance work mostly for DC. Something akin to Kirby Krackle appears in the depiction of the alien in a story called “The Man Who Collected Planets”***. While the alien is surrounded by something not dissimilar to Kirby Krackle it covers an uncharacteristically narrow area and the primary purpose appears to be more of a means of providing him with a fiery aura than of suggesting a form of energy. 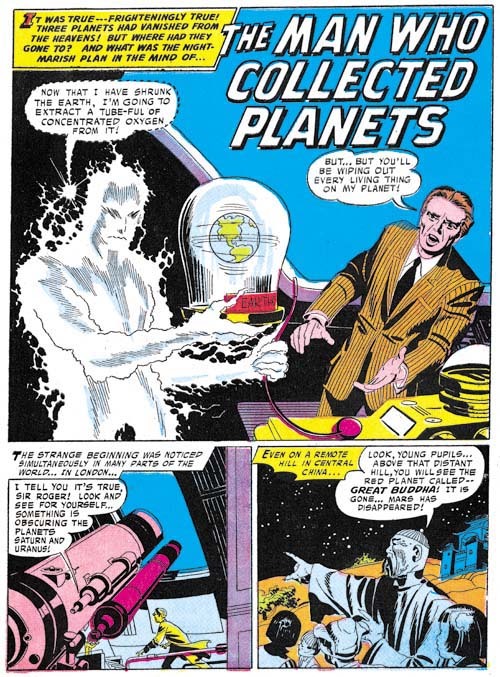 However “The Man Who Collected Planets” contains panels that show something very much closer to true Kirby Krackle than that used in drawing of the alien. Here it truly is energy that is being depicted. The particles have become more varied in size a more clumped together. However unlike typical Kirby Krackle the particles are still not very rounded in shape. This was no accident as the same Kirby Krackle precursor appears elsewhere in the story. 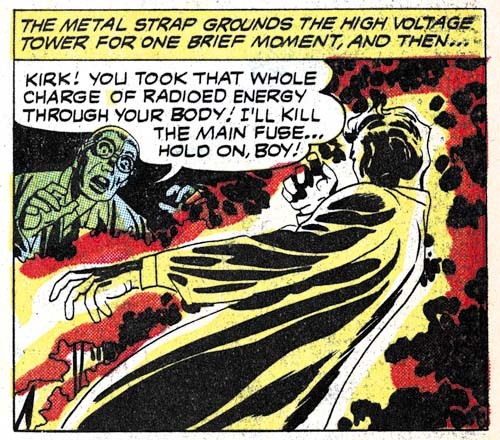 Kirby did his own inking for most of the horror or science fiction stories that he did for DC. 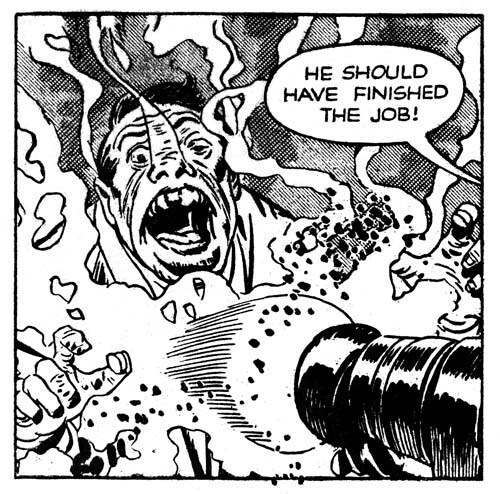 “The Man Who Collected Planets” is a great example of Kirby inking Kirby. So in this case we can safely give Kirby the credit for this Kirby Krackle prototype. House of Mystery #84 (March 1959) “The Negative Man”, panel from page 3, pencils by Jack Kirby, inks by Marvin Stein? Further examples of a Kirby Krackle prototype appear in another story that Kirby drew for DC, “The Negative Man”. This story is again about an unearthly being and something similar to Kirby Krackle is used to provide the being with a fiery aura. 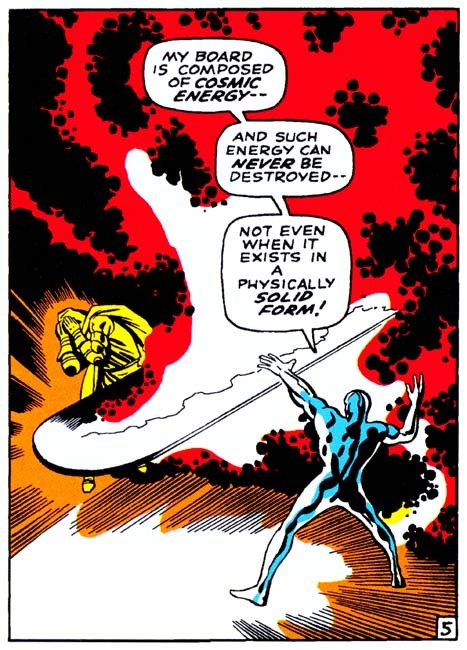 But once again it is elsewhere where even better examples of Kirby Krackle can be found such as the energy wake left behind the negative man of one panel from the third page. House of Mystery #84 (March 1959) “The Negative Man”, panel from page 5, pencils by Jack Kirby, inks by Marvin Stein? 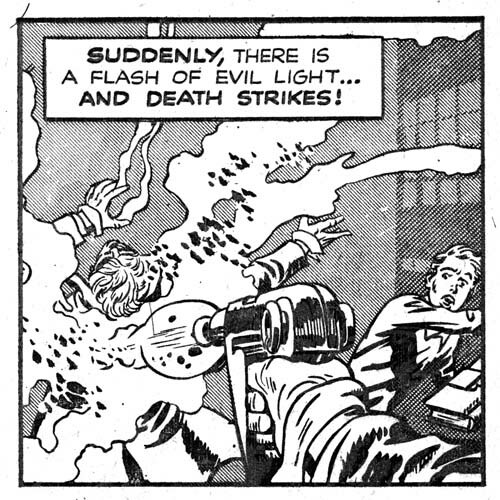 An even better example of Kirby Krackle prototype is found in small panel from page 5 where the negative man unleashes his power. The particles are relatively large and not at all circular but the clumping is very much like typical Krackle. House of Mystery #84 (March 1959) “The Negative Man”, panel from page 2, pencils by Jack Kirby, inks by Marvin Stein? The Kirby Krackle prototype from “The Negative Man” is very similar to that found previously in “The Man Who Collected Planets”. However while Kirby inked his own pencils in the earlier story some other artist inked “The Negative Man”. I am not positive as to who that inker was but the blunt but fluid brushwork looks very much like the work of Marvin Stein so I questionably attribute it to him. The two stories are similar enough that perhaps Stein used the earlier Kirby inked story as a reference when inking this one. Or perhaps Kirby had already begun to include how a story should be spotted in his pencils. In either case the use of the Kirby Krackle in this story should be credited to Jack Kirby. While the infrequent use of Kirby Krackle in the earlier publications can be explained by the lack of appropriate stories, its absence from Kirby’s earlier silver age work for Marvel is more difficult to understand. There certainly were a number of stories with subjects seemingly well suited for Kirby Krackle. It would seem that Jack had just forgotten about it. Perhaps there is some truth in the explanations previously used to explain the emergence of Kirby Krackle but not as inspiration for its creation but rather as a reminder to the artist of an almost forgotten technique. Once true Kirby Krackle appeared it was already exhibited the classic clumping of round particles and in this respect it differs from the earlier prototypic versions. Not perfect circles but not the more extended shape of the prototypes. 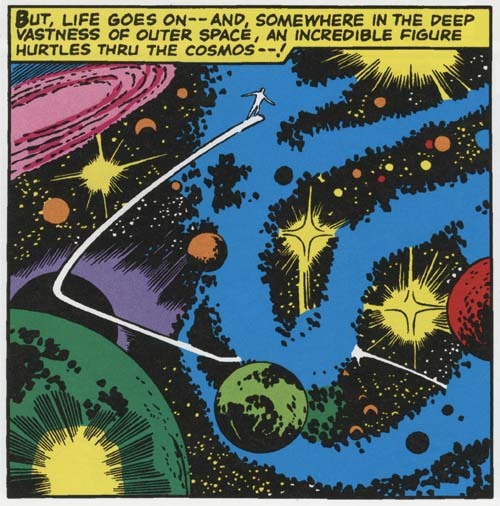 While classic Kirby Krackle was used to portray a simmering energy, the same purpose the prototypic form had been put to, Jack also used it when depicting the cosmos. Kirby Krackle always seem to have a cosmic connection but had not previously been used when drawing outer space. I suspect Kirby was using this device to suggest that space was more than vast distances of vacuum but a place filled with potent energy. Certainly with the help of Kirby Krackle, Jack’s astronomical visas became more exciting than any other comic book artists had ever achieved. I have previously written about Kirby Krackle but I have decided to gather it all together with some new information. I will provide links to my previous posts but the reader will find little more than what is covered here (Kirby Krackle, More Kirby Krackle). Shane Foley has written an excellent article available online exploring the appearance of Kirby Krackle in the Marvel comics (Kracklin’ Kirby, Jack Kirby Collector #33). 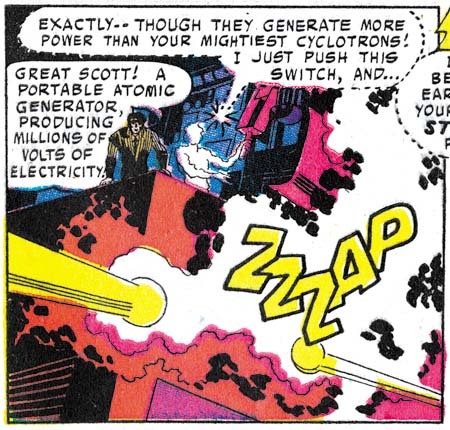 While he understandably failed to make the connection with previous examples of Kirby Krackle, his article does a marvelous job of tracing its use in silver age comics. * The overuse of Kirby K… is so extensive that my reaction is to wonder whether the originators of these terms were more interesting in getting credit for coining a cute name than in any serious investigation into Jack Kirby’s artistry. ** I do not know who to credit for first trying to draw attention to this early example of Kirby Krackle. It was brought up on the now defunct Kirby List where the poster provided a page number based on the Verotik Blue Bolt book. Unfortunately that volume lacks paging and the image that at the time I thought was being referenced was not an example of Kirby Krackle. 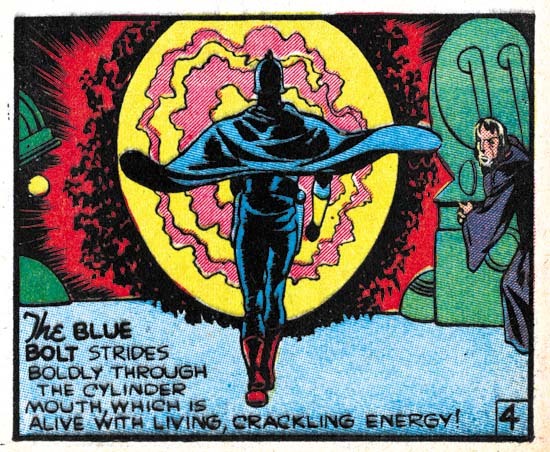 I came across the panel from Blue Bolt #5 during a recent review in preparation for a serial post I hope to do on Blue Bolt. I am sure it is that panel that the Kirby list poster was trying to refer to. *** The use of Kirby Krackle in “The Man Who Collected Planets” was originally pointed out to me by Ger Apeldoorn in the comments to one of my early posts on Kirby Krackle. In a comment to my previous post (Kirby Krackle) Ger Apeldoorn remarked on the existence of another Kirby Krackle prototype. Unfortunately Ger was unable to provide the specific comic that it appeared in. Perhaps he meant the one that was recently brought to my attention (thanks CL), “The Man Who Collected Planets” from Tales of the Unexpected #18 (October 1957). The Kirby Krackle prototype also appears on the cover (which Kirby did as well) but I find the splash page a better example of this technique. I have previously dismissed some of the supposed Kirby Krackle prototypes (based on techniques used to indicate smoke), but how does this new (for me) contender stack up? Well it is composed of rounded (but not circular) spots, there is a tendency to form clusters, they are meant to depict energy (although more of a simmering than a high energy) and there is a cosmic connection (he is after all an alien). So while it is not perfect Kirby Krackle it is so close to the real thing that it makes a perfect prototype. When I wrote a serial post on Kirby’s Austere and related inking styles I included a chapter on his DC work (Jack Kirby’s Austere Inking, Chapter 7). Unfortunately at the time I had access to a limited portion of that work and so I could only make some provisional conclusions. Now I am able to examine a much better selection of Kirby’s DC material but I have yet to do a careful review so my observations must still be considered as tentative. My belief is that the art for “The Man Who Collected Planets” as well of the cover was inked by Jack Kirby himself. 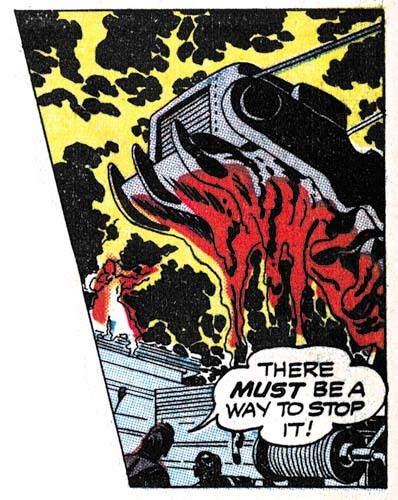 Perhaps the best indications that this was Kirby’s inking can be found in the last panel of the image provided above. Observe the rather blunt but well controlled brushwork, the scalloped inking pattern own the man’s shoulder and the use of short brushwork arranged into strings. So the credit, if the reader accepts this as a true Kirby Krackle prototype, belongs to Kirby. As I described above, the Kirby Krackle prototype surrounding the alien figure is used to describe a simmering energy and not the high energy that true Kirby Krackle depicts. The lower energy level drawn by Jack is quite appropriate for his subject. However the story includes art where much higher energy levels are shown, as for example the panel from page 3 shown above. As can be seen this Kirby Krackle prototype is even closer to the real thing. The dots are more irregular in size and they form more obvious clusters. Personally I cannot see how anyone could claim this is not a perfectly good prototype from which true Krackle was developed. I cannot resist providing another panel to show that my previous example of the Kirby Krackle prototype was no accident. While I fully accept this as a prototype, that by no means negates my claim that the example I provided from Captain 3-D (Kirby Krackle) was a Krackle prototype. Far from it, I believe it only strengthens my claim. The DC example is just what would be expected as a step intermediate between the earlier Captain 3-D (1954) and the full blown Krackle that Jack started using in 1968. Only small changes needed to go from the primitive version from Captain 3-D to the better (but still not perfect) version in the DC story. This means that I still maintain that Joe Simon was probably responsible for originating what would later become called Kirby Krackle. There is a virtual cottage industry around identifying some aspect of Jack Kirby’s artistry and naming it with a word starting with the letter ‘K’ (better yet if the chosen word actually starts with a ‘C’). I find such terms annoyingly cute and even worse some have rather vacuous foundations (see Kirby Kolor, A Kirby Myth and Kirby Kolors, Revisited). There is one such term, Kirby Krackle, which is so entrenched in comic literature that I feel that it must be accepted. No matter how grating the name, Kirby Krackle really does describe an important aspect found in much of Jack’s later work. 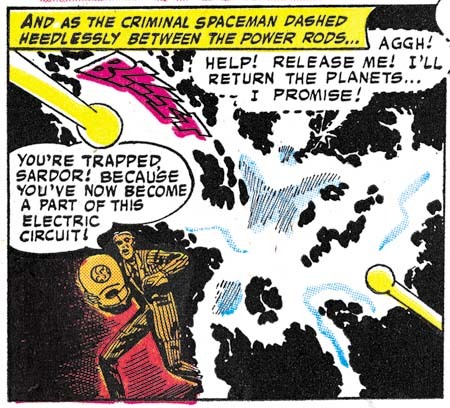 Kirby’s art for Marvel Comics in the 60’s began to show clusters of round dots depicting enormous but not necessarily directed energy, often of a cosmic nature. Shane Foley wrote an excellent article on Kirby Krackle (Kracklin’ Kirby, Jack Kirby Collector #33) were he traces the appearance of this device. 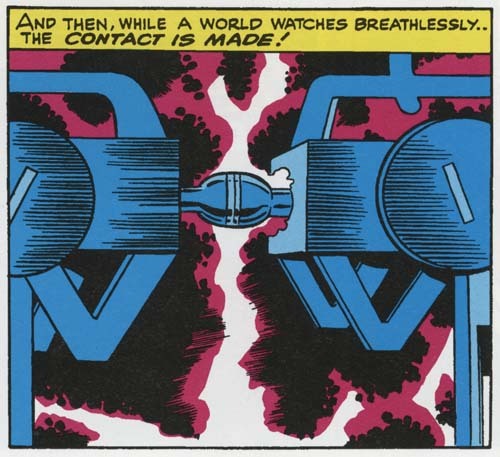 Because of the manner that the work was created, many experts have claimed that Kirby’s inker Joe Sinnott actually came up with the device and Kirby liked what he saw and adopted it. Of course there are Kirby fans that were unwilling to accept any of Jack’s techniques as originating anywhere other than from the King himself. And so the race was on to find Kirby Krackle precursors in earlier work by Jack to prove that the idea came from him and not Sinnott. Frankly I find the the examples I have seen of the supposed Kirby Krackle prototypes to be less then convincing. Most are inking techniques that were used to depict smoke. These prototypes have four strikes against them. They do not take the shape of round dots, they do not form clusters, they are not used to depict high energy, and there are no intermediate examples that show they evolved into true Kirby Krackle. With so many points against them these so called prototypes can be discarded from serious consideration. I would like to suggest yet another Kirby Krackle prototype. One found in the work that Kirby drew for Captain 3-D (December 1953). Besides the panel shown above, another example can be found from page 2 of the same story used in an earlier post (Captain 3D). Now I am not claiming these are true Kirby Krackle. Here dashes rather then dots are used and the dashes do not quite cluster as closely as in true Kirby Krackle, but it would not take much to make the change from the prototype to the real thing. Further the prototype is used to depict true energy; in fact there is a cosmic connection in that the weapon is called a gamma ray gun. Unfortunately there is a problem for those Kirby fans who would like to use Captain 3-D Kirby Krackle prototype as proof that the idea came from Jack himself. These pages were not inked by Kirby. Worse yet, during the Simon and Kirby collaboration Jack did not indicate spotting in his pencils. Kirby drawings were line drawings only and it was up to the inker to determine the spotting. Joe Simon was the inker for page 3. Page 2 was inked by Steve Ditko but with touch-ups by Simon. I really cannot say for certain who inked the Kirby Krackle prototype on page 2 but since it is done in the same manner as page 3 I credit it to Joe as well. But somehow I do not think comic fans are going to begin calling this technique Simon Snackle.